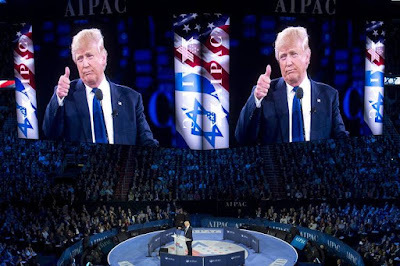 The news media is abuzz today with reports that, speaking before the American Israeli Public Affairs Committee (AIPAC) conference in Washington D.C. - the annual gathering of rabid right-wing Israel supporters - a presidential candidate vowed to move the U.S. Embassy in Israel from Tel Aviv to Jerusalem. So who was it this time? Donald Trump. "We will move the American Embassy to the eternal capital of the Jewish people, Jerusalem," he bellowed, reading from a script written for him by his son-in-law Jared Kushner, publisher of the conservative, pro-Israel weekly The New York Observer. Kushner took over the business from his father Charles, a real estate mogul and convicted criminal once described by The Jewish Week as "one of the marquee names in American Jewish philanthropy." So why is this news? It's not. 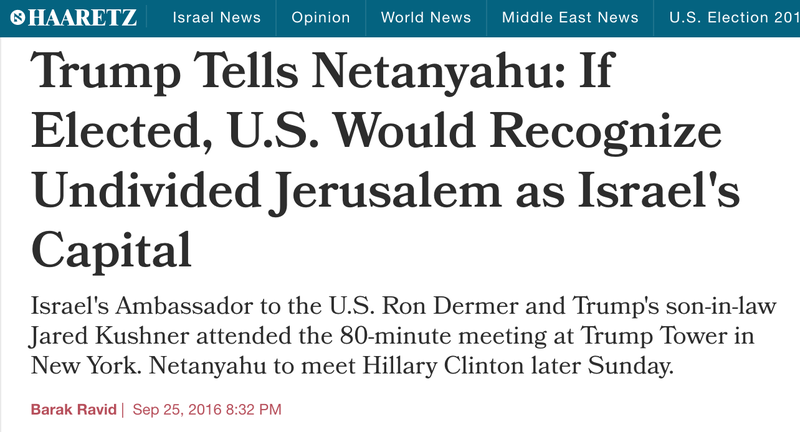 Promising to recognize Jerusalem as Israel's undivided capital and to move the American embassy there is part of Pandering 101 for Oval Office hopefuls. It is one of those litmus test talking points; the thing a politician says to prove the depths of his or her obsequiousness to a minuscule but influential cadre of donors and king (or queen) makers. Every candidate in the past few decades knows this. It's an easy vow to make, and no one ever pays any political price for inevitably breaking it (since half of Jerusalem remains occupied territory and actually moving the embassy there would be a clear violation of international law (and long-standing U.S. policy, recently upheld by the Supreme Court), which doesn't recognize Israel's claim over the historic city). Making such an absurd promise plays well to the writhing masses at AIPAC confabs, establishes one's Zionist bona fides, and is a quick and easy way to offend indigenous Palestinians living under occupation, apartheid and blockade without actually flipping them the bird. Nevertheless, the press continues to report on this blustery promise, no matter who utters it, as if it actually merits attention. Obama's statement was met with instant criticism and he wound up walking it back almost immediately. Five weeks after delivering those remarks, Obama effectively retracted them during an interview with CNN's Fareed Zakaria, saying, "You know, the truth is that this was an example where we had some poor phrasing in the speech. And we immediately tried to correct the interpretation that was given." The next summer, as election day neared, Clinton repeated her pledge, adding that "the embassy should be moved from Tel Aviv before year's end." Every Republican Party platform in the past 20 years has maintained the fiction that the embassy would be moved to Tel Aviv at the earliest convenience. The 1996 platform even vowed that the next "Republican administration will ensure that the U.S. Embassy is moved to Jerusalem by May 1999," while four years later the party promised that "the next Republican president will begin the process of moving the U.S. Embassy from Tel Aviv to Israel's capital, Jerusalem." 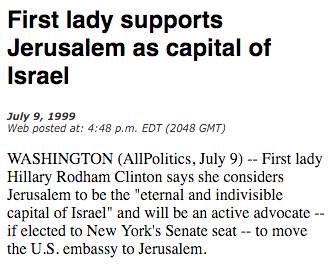 Before that, in 1992, the Clinton/Gore campaign hit the incumbent Bush administration for balking at the official recognition of "Israel's sovereignty over a united Jerusalem." Their campaign promised voters that "Bill Clinton and Al Gore will... support Jerusalem as the capital of the state of Israel." Al Gore, who tried to win the Democratic nomination for president that year, reportedly said in September 1987 that "he would consider moving the U.S. embassy from Tel Aviv to Jerusalem." In April 1984, during a heated Democratic primary season, Walter Mondale and Gary Hart bent over backwards to assure voters in New York City that they too supported moving the U.S. Embassy from Tel Aviv to Jerusalem (a position even Israelis themselves understood as hollow political posturing). Walter F. Mondale said he had supported such a move for 20 years, and he asserted that Senator Gary Hart had changed his position on the issue five days ago. In the past two weeks, Mr. Hart has denied that he suddenly changed his position, but has said his position has ''evolved.'' 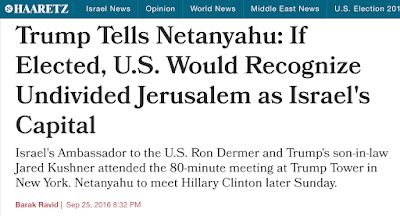 He has said firmly that if he became President, he would move the embassy to Jerusalem. The Rev. Jesse Jackson is the only one of the three candidates who opposes moving the embassy. The Reagan Administration also opposes such a move because the status of Jerusalem has long been disputed and the United States does not support Israeli sovereignty over the city. Despite efforts by New York Senator Daniel Moynihan and California Congressman Tom Lantos to introduce a bill mandating the move, Reagan was adamant about not relocating the embassy, as such a divisive policy would, according to his Secretary of State George P. Shultz, "be very bad for the United States" and "damage our ability to be effective in the peace process." The pandering was so thick, however, that a month later the Reagan administration had to pretend to consider supporting the move in order to stave off losing votes in the upcoming election. Though the bill eventually stalled, Los Angeles Times syndicated columnist Nick Thimmesch, who called the proposal "one of the dumbest ideas to be advanced in Congress this session," lamented that "some of the election-year pandering in the Republic verges on the obscene" and credited the ill-conceived gambit to the lawmakers' "blind obedience to the Israel lobby (American Israeli Public Affairs Committee)." That was October 3, 1984. By 1986, another bill was introduced to move the embassy, this time brought to the Senate floor by segregationist Republican Jesse Helms. During the 1980 presidential campaign, Reagan attacked the Carter administration for abstaining from a United Nations Security Council resolution condemning Israel's attempted annexation of East Jerusalem and calling upon all countries to remove their embassies from the city. Before that, on March 17, 1972, Michigan Congressman Gerald Ford, then the Republican Minority Leader, told a Zionist Organization of America regional meeting in Cleveland that the Nixon Administration should transfer the U.S. Embassy to Jerusalem. Two years later, after first replacing Spiro Agnew as Vice President and then becoming President himself following Nixon's resignation, Ford backtracked on his previous position. "Under the current circumstances and the importance of getting a just and lasting peace in the Middle East, that particular proposal ought to stand aside," Ford said at his very first presidential press conference on August 9, 1974. It's been over four decades since then and, sadly, while Palestine remains under brutal occupation, Israeli colonies continue to expand with impunity, and Palestinians are subject to ongoing oppression and violence, election-year pandering and blind obedience to the Israel lobby has become more obscene than ever. March 22, 2015 - In his own grotesque AIPAC speech today, Ted Cruz reiterated his promise regarding moving the U.S. Embassy from Tel Aviv to Jerusalem. "On my very first day in office," he declared, "I will begin the process of moving the American Embassy to Jerusalem, the once and eternal capital of Israel," using the AIPAC-approved epithets always used by fawning politicians to describe the historic city. Nodding with acknowledgement of the fact that this vow is an repeated refrain for presidential hopefuls, Cruz sought to dispel any doubt that he would act on his illegal and immoral promise. 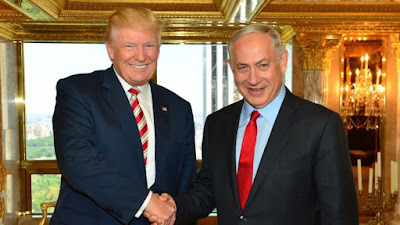 "I recognize for years a whole bunch of presidential candidates, both Republicans and Democrats, have said that," he told the assembled Zionists. "Some have said that standing here today. Here's the difference: I will do it." Thankfully, here's the thing: no, he won't. In fact, since he'll never ever be president, he'll never even get the chance. September 28, 2016 - During a meeting with Israeli Prime Minister Benjamin Netanyahu, who was in New York City for his annual propaganda stand-up routine before the United Nations General Assembly, Donald Trump again declared his intention, if elected president, to have the United States government officially "recognize Jerusalem as the undivided capital of the State of Israel." Such recognition would clearly violate both domestic and international law, as Israel's annexation of East Jerusalem in 1967 is considered illegal and illegitimate by the entire world, including the United States. 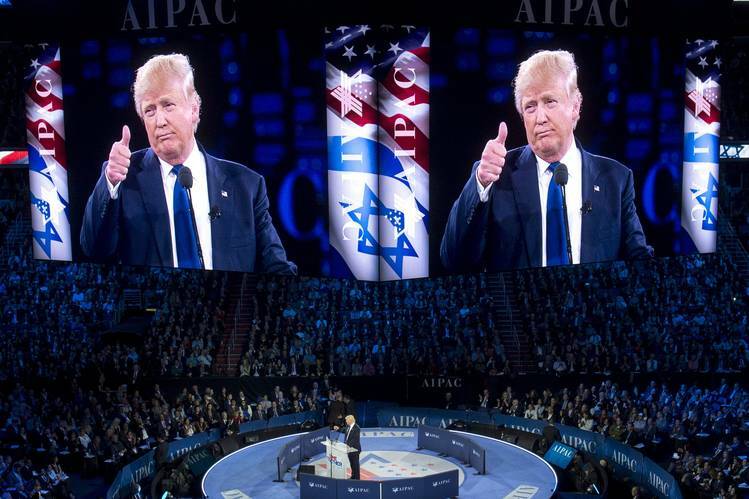 Trump's declaration - a common campaign promise by presidential hopefuls and constant refrain of AIPAC-funded Congressional blowhards - goes hand-in-hand with another absurd pledge routinely made by politicians: that the U.S. Embassy will be relocated from Tel Aviv to Jerusalem. It's a pandering platitude signifying nothing. But what else should we expect from this gilded nightmare?